Capt. Co. B. 81st O.V.I. Organized in September, 1861, under Colonel Thomas Morton, it joined General Fremont in Missouri, and performed severe service in Northern Missouri during the winter. In March, 1862, it was transferred to the army at Pittsburg Landing, and participated both days in the battle of Shiloh. After the evacuation of Corinth it operated in the vicinity until September, when it moved towards Iuka, again returned and fought at the battle of Corinth. The Regiment remained about Corinth until June, 1863, making many raids in the interior, when it moved into Tennessee and performed Garrison duty until the spring of 1864. It then joined Sherman's movement upon Atlanta. The 81st participated in nearly all the battles through to Atlanta, and after the fall of that city marched to the sea. It moved through the Carolinas and after the surrender of Johnston marched to Washington, then to Louisville and was mustered out July 13th, 1865. 81st Regiment Infantry. Organized in Ohio at large, under authority granted by Gen. Fremont, as Morton's Independent Rifle Regiment. Accepted by State September, 1861. Duty at Benton Barracks, Mo., till September 24, 1861. Moved to Franklin, Mo., September 24, thence to Harman, Mo., September 27, and duty there till December 20. Attached to Dept. of Missouri to March, 1862. 2nd Brigade, 2nd Division, Army of the Tennessee, to July, 1862. 2nd Brigade, 2nd Division, District of Corinth, Miss., to September, 1862. 1st Brigade, 2nd Division, District of Corinth, Miss., to November, 1862. 2nd Brigade, District of Corinth, Miss., 13th Army Corps (Old), Dept. of the Tennessee, to December, 1862. 2nd Brigade, District of Corinth, 17th Army Corps, to January, 1863. 2nd Brigade, District of Corinth, 16th Army Corps, to March, 1863. 2nd Brigade, 2nd Division, 16th Army Corps, to September, 1864. 2nd Brigade, 4th Division, 15th Army Corps, to July, 1865. SERVICE.--Expedition to Fulton, Calloway County, Mo., November, 1861. Expedition after guerrillas in Northern Missouri December 20, 1861, to January 4, 1862. Duty along Northern Missouri Railroad at Wellsville, Montgomery City and Danville (Headquarters at Danville) till March 1, 1862. Moved to St. Louis, Mo., thence to Pittsburg Landing, Tenn., March 1-15, 1862. Battle of Shiloh, Tenn., April 6-7. Advance on and siege of Corinth, Miss., April 29-May 30. Pursuit to Booneville June 1-14. Duty at Corinth till August. Guard stores at Hamburg till September 17. Movements on Iuka, Miss., September 17-20. Battle of Corinth October 3-4. Pursuit to Ripley October 5-12. 5 Companies Join October 19. Duty at Corinth till April, 1863. Raid to Tupelo, Miss., December 13-19, 1862, and January 3-19, 1863. Raid to intercept Forest January 2-3. Cornersville Pike January 28 (Detachment). Dodge's Expedition to Northern Alabama April 15-May 8. Great Bear Creek April 17. Rock Cut, near Tuscumbia, April 22. Tuscumbia April 23. Town Creek April 28. Moved to Pocahontas June 3, and duty there till October 29. March to Pulaski October 29-November 10. 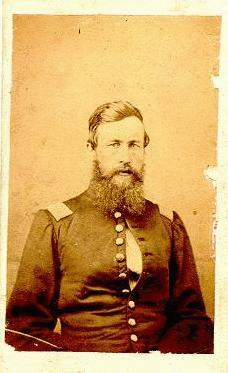 Duty at Pulaski, Wales, Sam's Mills and Nancy's Mills (Headquarters at Pulaski) till March, 1864. Moved to Lynnville March 5, and to Pulaski April 19. March to Chattanooga, Tenn., April 29-May 4. Atlanta (Ga.) Campaign May to September. Demonstrations on Resaca May 8-12. Snake Creek Gap and Sugar Valley, near Resaca, May 9. Near Resaca May 13. Battle of Resaca May 14. Lay's Ferry, Oostenaula River, May 14-15. Rome Cross Roads May 16. Advance on Dallas May 18-25. Operations on line of Pumpkin Vine Creek and battles about Dallas, New Hope Church and Allatoona Hills May 25-June 5. Operations about Marietta and against Kenesaw Mountain June 10-July 2. Assault on Kenesaw June 27. Nickajack Creek July 2-5. Ruff's Mills July 3-4. Chattahoochie River July 6-17. Battle of Atlanta July 22. Siege of Atlanta July 22-August 25. Ezra Chapel July 28. Flank movement on Jonesboro August 25-30. Battle of Jonesboro August 31-September 1. Lovejoy Station September 2-6. Non-Veterans mustered out September 26, 1864. Garrison duty at Rome till November. Reconnoissance from Rome o: Cave Springs Road and skirmishes October 12-13. March to the sea November 15-December 10. Ogeechee Canal December 8. Siege of Savannah December 10-21. Campaign of the Carolinas January to April, 1865. Salkehatchie Swamps, S.C., February 2-5. South Edisto River February 9. North Edisto River February 12-13. Columbia February 16-17. Lynch's Creek February 26. Battle of Bentonville, N. C., March 19-21. Occupation of Goldsboro March 24. Advance on Raleigh April 10-14. Occupation of Raleigh April 14. Bennett's House April 26. Surrender of Johnston and his army. March to Washington, D.C., via Richmond, Va., April 29-May 20. Grand Review May 24. Moved to Louisville, Ky., June, and there mustered out July 13, 1865. Regiment lost during service 4 Officers and 58 Enlisted men killed and mortally wounded and 160 Enlisted men by disease. Total 222.